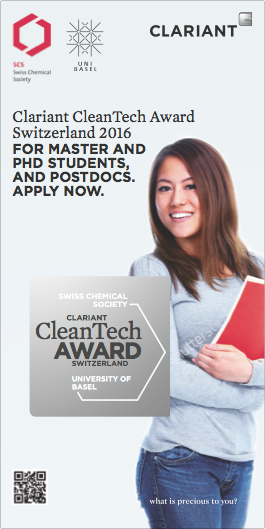 Clariant, the Swiss Chemical Society and the University of Basel are partnering to award the Clariant CleanTech Award Switzerland and offer a lecture slot at the »Clariant Chemistry Day, University of Basel« on October 12, 2016. The Clariant CleanTech Award Switzerland is endowed with a total of 10 000 CHF. The first prize is endowed with 5 000 CHF. This award program will honor outstanding scientific achievements of Master students, PhD students, and Postdocs in Switzerland in the field of Sustainable Chemistry, in areas such as resource efficiency, renewable energy, renewable raw materials or green technologies and environmental protection. With Research & Development the chemical industry contributes to tackle the challenges of our society by creating product and process innovation. As a company that creates value through sustainability and innovation, Clariant is particularly concerned about strengthening the knowledge base of CleanTech in Switzerland by sponsoring basic research and fostering the knowledge and technology transfer between industry and academia. by July 31, 2016 via the online form. Clariant’s corporate strategy is based on five pillars: increase profitability, reposition portfolio, add value with sustainability, foster innovation and R&D, and intensify growth. Clariant’s worldclass products and services play a key role in its customers’ manufacturing processes and add value to their end products. The company’s success is based on the know-how of its people and their ability to identify new customer needs at an early stage and to work together with customers, an international network of chemists, scientists, businesspeople, engineers, and specialists in other sectors to develop innovative, efficient solutions.